JNN 28 April 2014 SHANGHAI — A regional airliner built by Commercial Aircraft Corporation of China, Ltd. (COMAC) returned to Xi’an on Monday after completing test flights in natural icing conditions in Canada. The ARJ21-700 is a regional airplane made by the Commercial Aircraft Corporation of China (COMAC). 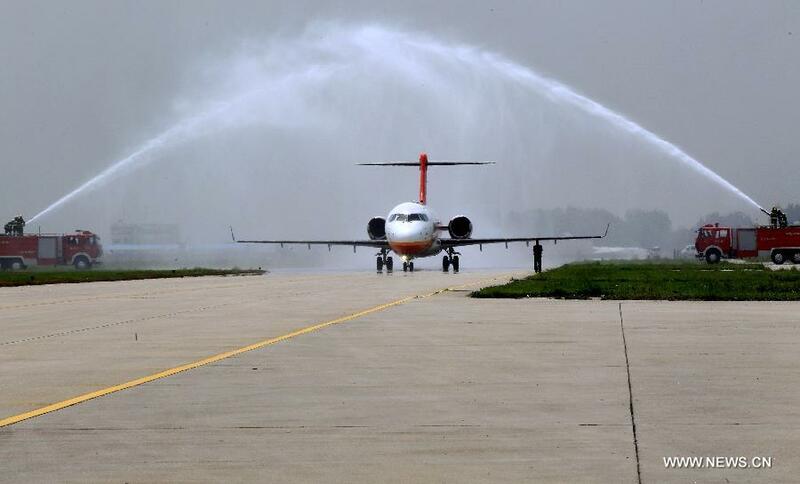 An ARJ21-700 regional airplane which has accomplished a global test arrived in a test center in Yanliang District of Xi’an, capital of northwest China’s Shaanxi Province, April 28, 2014. It was the first time for the airliner, a twin-engined ARJ21-700, to carry out test flights abroad under special meteorological conditions, sources with COMAC said. It also marked the completion of a 30,000-km flight around the world by the airliner, the country’s first domestically made turbofan-engined regional jet. During the flights, the anti-icing and de-icing functions of the jet’s wings, windscreen and engine nacelle were tested and flight data were collected. The test flights demonstrated the airliner’s stability and its ability to cope with extreme weather, said COMAC president He Dongfeng. The success has also opened a door for China’s civilian aircraft to test abroad and has accumulated knowledge for follow-up tests, He added. COMAC has so far received orders for 252 ARJ21-700 jets from 13 customers at home and abroad. The first two jets, coded 105 and 106, left the assembly line at the end of 2013 and are expected to be delivered early next year. This entry was posted in Asia Pacific and tagged China Commercial Jet Airplane. Bookmark the permalink.